Rio and I live near an area in Kansas called the Sandhills, near Hutchinson. North of our home is another geographical region called the Smoky Hills. Most of our preparation for the Tevis Cup had taken place in these areas through a technique called long, slow distance (known to distance riders as LSD). Before you can reach any goal, you must start at the beginning. Babies rock, then roll on their tummies, crawl, walk, then run (and destroy but that’s another subject). Kansas is not flat–unless you compare it to the Sierra Nevada. Perspective can be life changing–sometimes a shift in visual direction can make something look smaller or larger, sometimes it can shift a view for someone just enough to present new solutions. Sometimes perspective can make you question your chances. To a baby, walking may seem intimidating if all it can do is rock back and forth. To a Kansas flat lander, a Sierra Nevada mountain can look pretty intimidating when most of what you’ve seen is Sand or Smoky Hills. The morning of August 5th, after winding down that first mountain road, we started our climb into the mountains on our trail to Auburn. In distance riding, whether it be competitive trail or endurance, you start with walking and a small amount of trotting. There are many people who have a set program for this LSD, also known as “conditioning”–they have very rigid schedules of riding x amount of times per week with y amount of distance at z speed. My life is crazy, there is no way I can even entertain the thought of a schedule–let alone an organized one. Here’s my program–I ride as much as I can, when it works for me. There. That’s it! There is absolutely nothing wrong with either way–each rider has to figure out what works best for him or her and their mount. Conditioning, ideally, takes place over at least several months, if not years to start doing distance rides. Slow conditioning builds bone, ligaments and tendons, muscle and cardiovascular strength over time–if you go too fast, you can end up with with sad to catastrophic results such as ligament tears all the way to fracture or the death of your equine partner. If you take your time and build a strong base, you will go far. Literally. If you do too much conditioning, especially in front of a big ride, you can spend all of your investment prior to getting to somewhere like California and have a worn-out horse that won’t finish. It’s a gamble either way–I suspect luck has a lot to do with many of our endeavors. 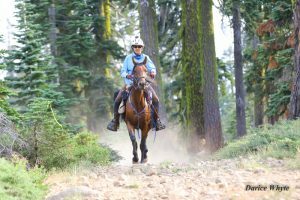 The shorter, slower distances in competitive trail rides (CTR’s) are great for building up to higher distances–I started doing CTR’s in 2006 with my older gelding Cisco, got hooked and kept going. My friend Jackie introduced me to the sport and also started me in endurance, taking me to my first 50 mile ride in Oklahoma. It’s all Jackie’s fault. I thank her frequently whether she knows it or not. She was my “dealer”, and now I’m the addict. Where CTR’s are a gateway drug, endurance is much stronger, and has sunk in deeper into my soul–you don’t get a lot of awards, definitely no money from finishing endurance rides… What you do get is an intrinsic reward and a high that keeps you running back for more. Jackie told me about this “Tevis Cup” in California, and when she went out and did it, her stories lured me into thinking I needed to try that too. I wanted to try to do the Tevis Cup on Cisco; fate would dictate that was not to be. Cisco got diagnosed with navicular syndrome–ultimately I retired him from competition. Through Lady Luck, I met Rio through my friends Steve and Priscilla Lindsey, and I had new hope for a competitive mount. As we built our relationship and around my back injury, Rio and I accumulated 460 miles in competitive trail rides with North American Trail Ride Conference, NATRC, (usually 40-60 miles over both days of the weekend) prior to 2016; we began shooting for 50 mile rides in the American Endurance Ride Conference, AERC, the summer of 2016. Our first 50 attempt was just that–an attempt–she and I rode by ourselves on a night ride in Oklahoma. She was a rock star. She was confident, she was smooth…as we were going through our second loop to finish up 38 miles, I began noting lightning. And then lightning and thunder. After we got through with our vet check and started the mandatory hold time, the sky opened up and it poured! I blanketed Rio, went inside my trailer…thought to myself, does completing really mean that much to me? NAAAAAhhh…..I called the ride manager and pulled (rider optioned). Our next attempt went much better–we went to the Season Finale ride after Thanksgiving in Oklahoma again…we took nearly the whole time because I wanted to make sure she was going to handle the distance ok and as we crossed the finish line, she called into camp, 5 people cheered (almost all of the people left in camp) and I welled up with tears–I was back in the game. It was another baby step under our belt. Rio marched up the mountain sides in the first part of the ride. I noted the severity of the climb. It was really steep! I thought of our hill conditioning at home and for a moment doubt started swelling up. I cursed at myself and wished that we had done more hill repeats (I don’t have many steep hills at home, but the couple that I do I spent going up and down. And up and down. Times a lot.). Perspective is everything. When you look at how far you have to go, it’s overwhelming. I realized that. I questioned if we could do this ride. I knew that if we were going to keep going, I had to quit thinking about that. I chose to look at the ground right in front of us, rather than 85 miles away (although in the back of my mind I visualized us going into McCann to ride our victory lap)–thoughts of the kid’s movie “Finding Dory” went through my mind. Dory sings “just keep swimming” over and over. And over. I changed it to “just keep riding”. One baby step at a time. They give you a sheet with the mileages at check points–instead of thinking of the end, I broke it down into miles until the next check point. We passed and went over Cougar Rock. We made it to Red Star Ridge, the first vet check. We were close to cut off times, but we passed and kept going. Step by step we just kept riding.